Plainly put, get a list of superfoods, stock them as healthy snacks and eat them. They are by far the best health foods to eat. Superfoods are jammed full of great nutrition so they should be consumed in abundance on a regular basis. We should remind ourselves that food is not just about vitamins and minerals, carbohydrates, fats and protein. You need to condsider the antioxidant, immune-stimulating, anti-cancer, hormone-balancing and anti-bacterial properties. Superfoods should also include a range of other ingredients that can activate or sedate the body's systems as required. This list of superfoods is by no means complete but considers the total amount of super nutrients offered in each case. A good mixture of supergreens includes barley grass, chlorella, spirulina, wheat grass, wheat sprouts and other green concentrates. Besides containing vitamins and minerals in their natural food state, These greens are also packed with antioxidants, enzymes and co-enzymes, complete balanced protein with all the essential amino acids, trace elements and chlorophyll. In addition they help the body maintain a more alkaline state. Goji berries are a recent addition to the list of superfoods. They are round and red, rather sweet tasting. Grown in China, Tibet and Mongolia, goji berries were traditionally used to boost energy and stimulate Qi (energy flow). There are a range of health benefit claims including anti-ageing and this has made them very popular. 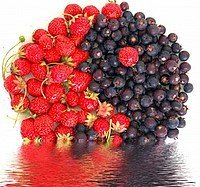 The berries do seem to enhance the immune system, improve eye health, protect the liver, boost sperm production and open up the kidney channels. They contain complex phyto-nutrients and bioflavonoids including betaine (brain and liver support), physalin, beta-sitoserol (prostate health), cyperone (benefits heart and blood pressure), solavetivone (anti-fungal, anti-bacterial properties) and others chemicals. Oats have a high fibre content, half soluble and half insoluble. The soluble fibre portion contains a component called beta-glucans which has some blood cholesterol-lowering effects. The whole-oat variety, either rolled oats or grains, is a very good source of tocotrienols (vitamin E family). Try adding oats to your fruit at breakfast because it slows down the blood sugar level spike. Dietary fibre has shown to lower the incidence of cancer, possibly because it contains lignan. The insoluble fibre is crucial for promoting bowel action and thereby relieving constipation problems. Oats also contain essential fatty acids, a good profile of amino acids and a range of vitamins and minerals including zinc, selenium, iron, magnesium and manganese. Garlic is another fantastic superfood to use on a daily basis if possible. You can use it fresh in your food or in capsule form. Garlic’s chief medicinal benefits are its blood pressure-lowering, lipid-reducing and atherosclerotic prevention properties. Garlic has also been shown to reduce the coaguability of blood by reducing platelet aggregation. It is also well-known as a natural anti-biotic. See here for more details on the health benefits of garlic. Blueberries are real little health powerhouses full of antioxidants and other health-promoting substances which support eye, heart and urinary tract health in particular. Blueberries have anti-ageing properties; they decrease free radicals that can damage organs and have important health benefits for the brain - (brain food). These positive effects may be due to its high anthocyanin and proanthocyanidin content. Add them to your oats for breakfast or put them in a smoothie. These include broccoli, cabbage, Brussels sprouts, bok choy and cauliflower. If you can eat three or more servings of these vegetables per week studies indicate that you could reduce prostate cancer risk almost by half, and in women the risk of breast cancer is significantly reduced. Other cancers may be prevented too. Cruciferous vegetables also contain compounds that help the liver to detox. Did you know that olive oil needs no preservative or anti-bacterial agents because bacteria cannot grow in it. Olive oil has special health properties and the so-called ‘Mediterranean diet’ with its high olive oil content is so highly regarded and promoted for good heart health. Some even claim that Olive oil rubbed on the body is easily absorbed and a good way of nourishing the skin and supporting a healthy lifestyle. Olive oil has a higher level of monounsaturated fat than other oils and contributes to maintaining good cholesterol levels. High polyphenolic compounds such as squalene, beta-sitosterol and tyrosol also benefits heart and vascular health. These phytonutrients have anti-inflammatory properties and beta-sitosterol in particular seems to control enlargement of the prostate gland. It's healthier for cooking too as Olive oil is more stable than other oils when heated. An alternative to olive oil is Grapeseed Oil - read about the health benefits of grapeseed oil. Green Tea contains polyphenols, which have powerful antioxidant properties. A cup of green tea contains about 300 - 400 mg of these cancer fighting properties. Various studies suggest that consumption of three or more cups of green tea per day can reduce the incidence of cancer, exert a protective effect on blood capillaries, stabilise blood lipids, and lower the risk of arteriosclerosis. It is also claimed to help weight loss by stimulating the metabolisim and fat burning. Find out more about the health benefits of green tea. All fresh organic foods have health benefits but some foods are particularly healthy because the nutritive content is greater, more complex and extraordinary in some way. Hense Superfoods are different from functional foods. You'll get the most benefits from superfoods in fresh organic form, or like garlic you can take them in capsule form to increase intake. There other superfoods such as cold-water fish with its high omega-3 fatty acid content; seeds such as pumpkin, sunflower and sesame seeds; flax seeds with their particular combination of fatty acids. Each of these foods is rich with nutrients, not just a few but often hundreds of different compounds. Nature has given us an incredible bounty but so many people have little regard for these remarkable foods. You'd be doing your health a great favour if you try to include a few of these superfoods in your daily diet and check out the benefits of a raw food diet.